Flat 4310 off.Flat 4310 off. 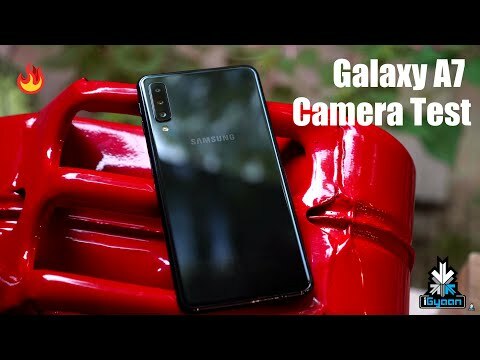 Elegant phone and brilliant performance, the camera are nowhere near to get complains in the department of the camera, the design is also good though there are some heat issues while playing games like pubg and all. Battery life is also a small issue and also the position of the fingerprint sensor is a bit in an uncomfortable position. Otherwise, the phone is overall a great buy and would be great for Samsung fans in the budget range. Samsung Galaxy A7 2018 comes with a FullVision display packed with tons of features. The device has an impressive set of cameras, a powerful processor and great battery life. In terms of battery life, the device can last you for an entire day. The device is a perfect choice under this price segment. I bought Samsung’s galaxy A7 solely for the triple camera setup on the back and the lock button fingerprint reader and i have to say i am very impressed by the device as the triple camera click very amazing pictures in low lighting also, then the fingerprint sensor below the lock button is also a great innovative idea and the fingerprint sensor is fast as well as secure, the additional it also has a great display which has very good viewing angles so overall it is a great device to have and would totally recommend it. Samsung is out with a mid range flagship killer and i wanted to give it a try so i went ahead and bought one. It’s only been a couple of days and i am already very impressed by this device firstly the performance on this device is great, the triple camera in the back attracts a lot of attention and click awesome pictures also. 13 Pricebaba users have written their experience with Samsung Galaxy A7 2018. If you own Samsung Galaxy A7 2018, please do leave your feedback too. Lowest price of Samsung Galaxy A7 2018 price in India starts at Rs. 17,990 Samsung Galaxy A7 2018 is available on Flipkart at Rs. 17,990 and on Amazon at Rs. 17,990. Prices updated on 18th April 2019. The Galaxy A7 boasts a 6-inch super AMOLED display bearing a resolution of 2220 x 1080 pixels. It has thin bezels with an 18:9 aspect ratio screen. Design-wise, there are no physical buttons on the front. A fingerprint scanner is embedded in the power button located on the right side. The rear camera is vertically stacked on the top left corner. Sensors on the phone include an accelerometer, magnetometer, proximity sensor & gyroscope. The device ships in Black, Blue, and Gold color options. The Galaxy A7 sports a triple rear camera setup comprising of 24MP primary snapper, 8MP ultra-wide and a 5MP depth sensor. The PDAF system aids in fast focusing & better low light pictures. The A7 is fitted with a 24MP selfie camera along with LED flash for better selfies in low light. The camera allows the user to control the depth of field and adjust the bokeh effect. It also offers Pro lighting mode and AR emoji. On the hardware front, the A7 is equipped with Samsung’s Exynos 7885 octa-core processor clocking speed of 2.2GHz. It is paired with 6GB RAM and Mali-G71 GPU. The hardware ensures smooth performance & seamless multitasking. This device offers 64GB internal storage which can be expanded up to 512GB via microSD card. The Galaxy A8 runs on Android 8.1 Oreo OS out of the box. The Galaxy A8 is backed by a 3300 mAh non-removable battery with support for fast charging. It offers dual SIM functionality & supports nano SIM cards. Connectivity options on this device include GPS, 4G LTE, 3G, 2G, WiFi, Bluetooth & VoLTE.